Our cake was derived from this recipe that is labeled “easy.” One look told me this did not meet my definition for easy – which would basically be quick with fewer dishes….but B stared it down on Pinterest and the ingredients honestly had the most appeal of those I’d been browsing. So, I made it easier….and more kid friendly. You could obviously improve on the aesthetics quite a bit if you are baking this on your own. Our cake got punched and pinched a few times but still turned out looking yummy…in my humble opinion. Chocolate cake mix with pudding included. it originally had 4 cups, taste at 2 and see what you think! 1) Preheat the oven to 350°F. Grease two 8″ cake pans. 2) To make the cake: follow box ingredients. 3) Divide the batter evenly among the prepared pans. 4) Bake the cakes as directed, until they begin to pull away from the sides of the pans, and spring back when lightly touched in the center. 5) Remove the cakes from the oven, and cool completely in the pans. 6) To make the frosting: Beat the butter and peanut butter until fluffy. 7) Beat in half the confectioners’ sugar and the salt. Continue adding confectioners’ sugar in batches, alternating with the milk, until everything is incorporated. Adjust consistency with more milk or sugar as needed to make a spreadable frosting. 8) To make the filling: Sift the cocoa, confectioners’ sugar, and salt into a large bowl. 9) Add the butter and shortening, and beat at low speed until the mixture comes together. 10) Add the milk, beat for another minute, scrape the bowl, and add the marshmallow crème. 11) To assemble the cake: Turn the cakes out of the pans. Place one layer, top side down, on a serving plate; trim off any dome beforehand, if necessary. Cover with the filling, and repeat with the remaining layers. 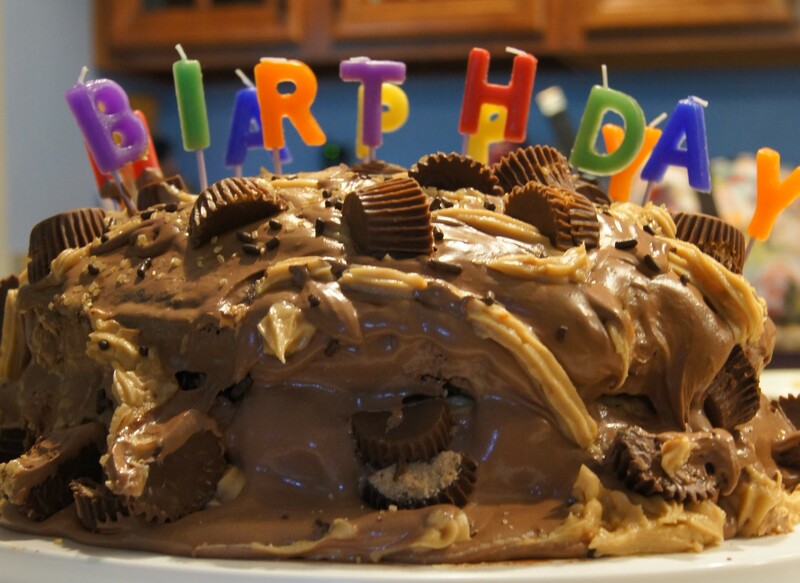 Cover the top and sides with the peanut butter frosting, and garnish with pb cups, as desired. Yummo! 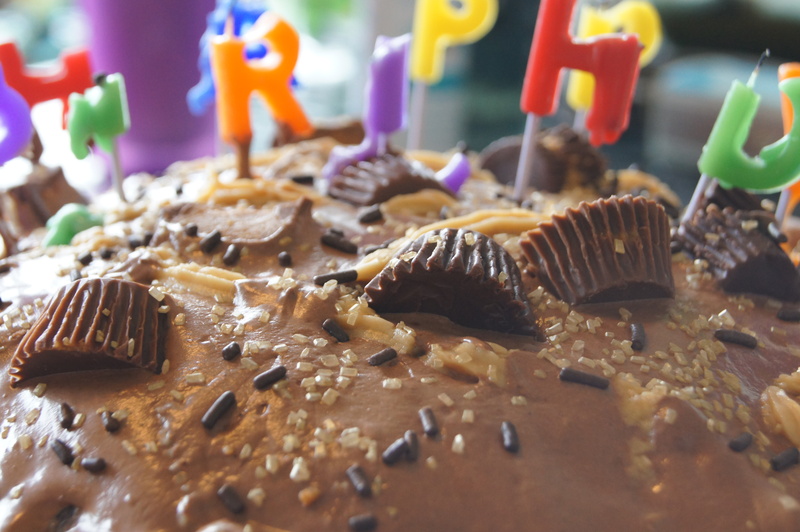 Who doesn’t like cake….with chocolate!?? !